Ending a tenancy must be done by the rules or you as the tenant may still remain liable for the rent and condition of the property. In general, ending a tenancy requires notifying the landlord within a certain amount of time (generally at least a one month period), closing utility accounts or reverting utility bills to the landlord’s name, cleaning the property to a high standard and arranging a meeting with the landlord in order to return keys and recover the initial deposit. When these steps have been taken, tenants can end their tenancies and leave the properties with a clear conscience and hopefully a good letter of recommendation in their pockets. In most rental agreements there is a section that defines how a tenant must give notice before a tenancy ends. Usually this requirement includes notifying the landlord or intention to quit the tenancy at least a month before the tenant actually intends to leave. Giving notice in writing, and keeping an identical copy in their records, is always a good idea for tenants. Throughout this last month the tenant may need to open the property for viewings if the landlord so desires, but the finer points (when the viewings will occur, how much notice will be given to the tenant) may differ according to rental agreements. While giving notice and ending a tenancy are natural aspects of the letting process, it is always best to follow the rental agreement to the letter – including any finer print. 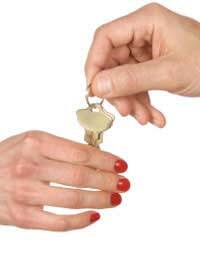 Most landlords and tenants expect to have one final meeting before a tenancy ends. At this time it is appropriate for the tenants to turn in their final sets of keys, and the landlords to return the deposit money that was paid at the start of the tenancy. Generally the landlord will want to have a final inspection of the property and proof that all utility accounts have been paid in full before returning the deposit money. If a landlord does not return a deposit immediately, up to one month from the end of a tenancy will still be an appropriate time period for this return. After one month, tenants are well within their rights to take further steps to recover their deposit. A solicitor or estate agent may prove helpful in this process. Ending a tenancy can be a bittersweet time, particularly if tenants have enjoyed their time at a particular property. Taking steps to minimise confusion – including giving required notice, closing utility accounts, cleaning the property and arranging a last meeting with the landlord – should help this process go smoothly.